In our first reading (1 Kings 17:17-24), Elijah cries out to God three times to raise the widow's son to life, and in God's mercy, the young man is restored to life. "Elijah went to Zarephath of Sidon to the house of a widow. The son of the mistress of the house fell sick, and his sickness grew more severe until he stopped breathing. So she said to Elijah, 'Why have you done this to me, O man of God? Have you come to me to call attention to my guilt and to kill my son?' Elijah said to her, 'Give me your son.' Taking him from her lap, he carried the son to the upper room where he was staying, and put him on his bed. Elijah called out to the LORD: 'O LORD, my God, will you afflict even the widow with whom I am staying by killing her son?' Then he stretched himself out upon the child three times and called out to the LORD: 'O LORD, my God, let the life breath return to the body of this child.' The LORD heard the prayer of Elijah; the life breath returned to the child's body and he revived. Taking the child, Elijah brought him down into the house from the upper room and gave him to his mother. Elijah said to her, 'See! Your son is alive.' The woman replied to Elijah, 'Now indeed I know that you are a man of God. The word of the LORD comes truly from your mouth.'" In our Gospel reading (Luke 7:11-17), Jesus encountered a widow about to bury her only son. He saw her plight and intervened. Jesus did not "call out to the Lord" as Elijah did. Jesus had within himself the authority and power to raise the young man to life. "Jesus journeyed to a city called Nain, and his disciples and a large crowd accompanied him. As he drew near to the gate of the city, a man who had died was being carried out, the only son of his mother, and she was a widow. A large crowd from the city was with her. 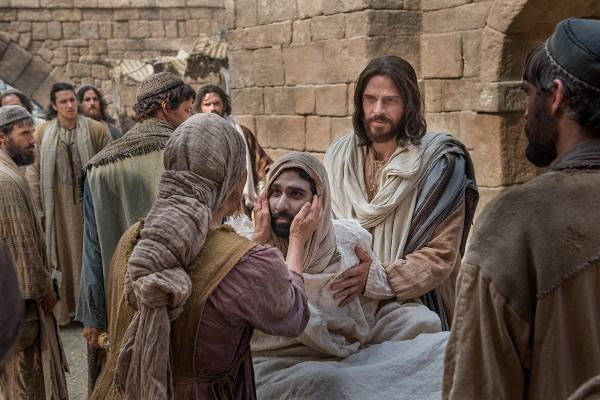 When the Lord saw her, he was moved with pity for her and said to her, 'Do not weep.' He stepped forward and touched the coffin; at this the bearers halted, and he said, 'Young man, I tell you, arise!' The dead man sat up and began to speak, and Jesus gave him to his mother. Fear seized them all, and they glorified God, crying out 'A great prophet has arisen in our midst, ' and 'God has visited his people.' This report about him spread through the whole of Judea and in all the surrounding region." In our Epistle, (Galatians 1:11-19), St. Paul was defending himself against accusations that his preaching was not in keeping with the Apostles. In his writing, he reminded his listeners that the Gospel he preached was "not of human origin" but was directly from Jesus Christ..
"I want you to know, brothers and sisters, that the gospel preached by me is not of human origin. For I did not receive it from a human being, nor was I taught it, but it came through a revelation of Jesus Christ. For you heard of my former way of life in Judaism, how I persecuted the Church of God beyond measure and tried to destroy it, and progressed in Judaism beyond many of my contemporaries among my race. But when God, who from my mother's womb had set me apart was pleased to reveal his Son to me, so that I might proclaim him to the Gentiles, I went into Arabia and then returned to Damascus. Then after three years I went up to Jerusalem to talk with Cephas and remained with him for fifteen days. But I did not see any other of the Apostles, only James the brother of the Lord." So we are reminded of the awesome love, power and mercy of God and that all good things come from God. We also see Jesus acting with the authority and power of God, because he is God.